Purpose To analyze the rule of recurrence risk for breast cancer patients after surgery in order to get characteristics for Chinese breast cancer. 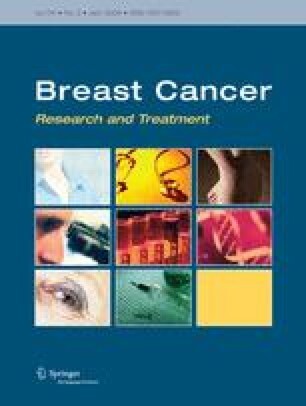 Methods We performed a retrospective study of 2,213 female unilateral breast cancer patients undergoing surgery in Cancer hospital of Fudan University, Shanghai, China. Survival curves were performed with Kaplan–Meier method and annual recurrence hazard was estimated by hazard function. Results Annual recurrence hazard curve for entire population showed a double-peaked pattern, with a first major recurrence surge reaching the maximum at the second year after surgery and a second recurrence peak near the 9.5th year. The analysis according to tumor size, axillary lymph node (ALN) status (T1 + T2 versus T3, node-positive versus node-negative) and menopausal status as well as hormone receptor (HR) status proved that the double-peaked pattern was present in each subgroup. Compared with ER-positive tumors, ER-negative breast cancers were more likely to recur early. As far as Her-2/neu status was concerned, Her-2/neu-positive patients exhibited a relatively pronounced and variable pattern and tended to have more relapse across all time periods (P < 0.05). Conclusions The double-peaked pattern observed in our patients gives further support to tumor dormancy hypothesis. It contributes to different treatment strategies (e.g. the type and timing of adjuvant therapy) for different patients, which provide the possibility to improve survival. Wenjin Yin and Genhong Di contributed equally to the work.